While boutiques and SI's have traditionally had a pretty decent stronghold where the consumer desktop was concerned, the notebook market has been a lot more unstable. Vendors like AVADirect, CyberPowerPC, iBuyPower, Puget Systems, and today, Mythlogic, are all essentially at the mercy of primary ODMs like Clevo, Compal, and MSI to give them whitebooks they can custom build for their customers. 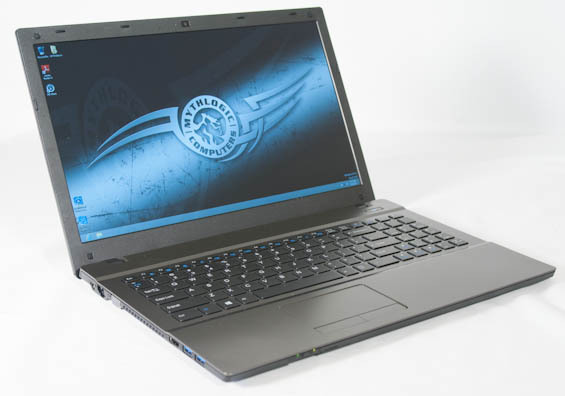 With ultrabooks gaining traction, that puts serious pressure on these vendors, as conventional 13.3" and under ultrabooks are much harder to offer in a customizable shell. Intel's 20mm or less thickness spec means socketed CPUs aren't an option, and what you're really left with, if you're lucky, is the ability to customize wireless connectivity, memory, and storage. Slim pickings. 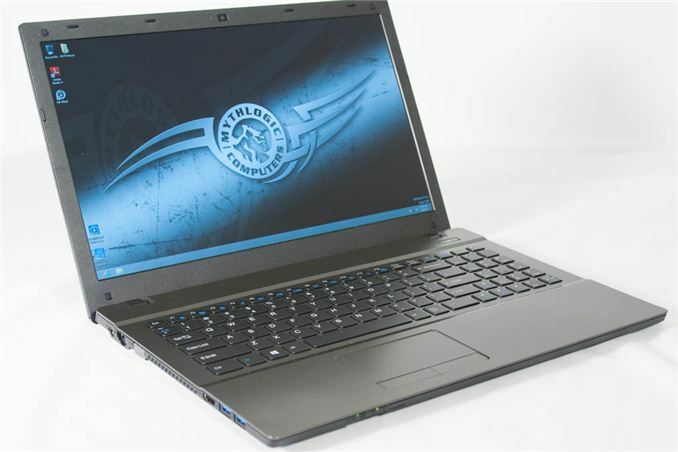 The expanded ultrabook definition gives boutiques a little more breathing room, though, and that's how we end up with a review unit like Mythlogic's Callisto 1512, based on Clevo's W550EU. Essentially what we're looking at is a much thinner 15.6" notebook that still offers the boutique the ability to customize the processor, and we get a 35W or even 45W CPU instead of the reduced voltage and wattage 17W Ivy Bridge chips in most ultrabooks from bigger vendors. And while these Clevo/Compal/MSI notebooks may sometimes not be as well built as their retail counterparts, they tend to offer the superior display options that the bigger vendors often won't. Dimensions 14.72" x 9.92" x 0.55-1"
Unfortunately, the exact configuration we were shipped for review can't be built on the Mythlogic site yet. The Intel Core i5-3340M is a refresh of Ivy Bridge not currently listed; you can either drop 100MHz and go for the i5-3320M, or gain 100MHz and go for the i5-3360M. Either way is probably fine; the incremental CPU options are appreciated but not strictly necessary. It's worth pointing out just how much of a performance jump you get going to standard voltage, though: top-end ULV Ivy Bridge runs ~2GHz before turbo, but the i5-3340M in our review unit starts at 2.7GHz and goes up from there. That the W550EU can support quad core CPUs suggests there's a good amount of thermal headroom here, too, so the i5-3340M will be much more liable to spend a lot of time at high turbo speeds. Paired with it is 8GB of DDR3-1600 courtesy of Patriot, and handling storage duties is a 256GB Samsung 840 Pro SSD, plenty for most users. Should that somehow not be adequate, the W550EU also features an mSATA slot, so if you need more storage you can pop a 256GB SSD into the mSATA slot and use the 2.5" drive bay for a 1TB mechanical hard disk. I'm disappointed the only optical drive option available is a standard DVD writer, though; an optional blu-ray drive would've been appreciated. Of course the major selling point here is the 1080p matte IPS display. While Clevo offers a version of the W550EU that uses a bog standard (and probably hideous) 1366x768 TN panel, Mythlogic wisely doesn't even offer it on their site. Eagle-eyed readers will note that this review unit features Intel's 802.11ac adapter. While I didn't have enough time to test it with a proper wireless-ac router, I will say that in its present state it's...definitely functional, but I found the range on it is somewhat lacking. About fifteen feet from my router and through two walls, signal strength was actually on the low side. On casual inspection, performance appeared strong and stable, but wireless networking is admittedly not my jurisdiction. Looking at their configurator, it actually appears to be cheaper to get an mSATA version of the 840 Pro than the 2.5" one. The specs look interesting (though surprisingly you've not listed the ability to put a dGPU, which is something boutique vendors tend to be good at), but in this day and age the design of the laptop is frankly inexcusable. It looks cheap, boring and already dated before it's even arrived! Yea it isn't. It doesn't even meet the 21mm spec, as the thickest point is at 25mm.